Another, um, good reason to care about genome sizes. You denizens of the science blogosphere probably will have heard about the, shall we say, “questionable” article by Donald Williamson (and communicated by Lynn Margulis) in PNAS, in which he claimed that insect larvae arose via hybridization between non-metamorphosing ancestral insects and Onychophora (velvet worms). Maybe this sounds silly to you. Me too. It also sounded silly to Hart and Grosberg (2009), who thoroughly debunk the hypothesis using data that were already easily available. You can read a play by play of the refutation over at Jerry Coyne’s blog Why Evolution Is True and in Scientific American. So, if it’s already been discussed on a popular blog, why bring it up again? Because this one relates directly to my area of research, and the subject of many a post here on Genomicron — genome size. 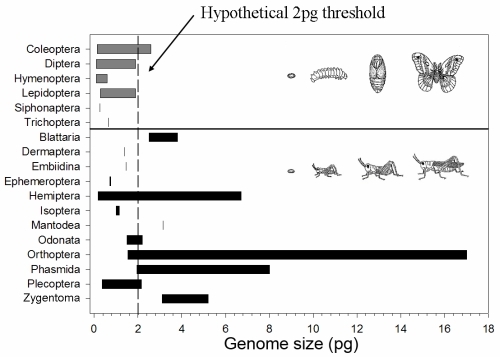 One of the “predictions” given in Williamson’s paper is that species of insects with complete metamorphosis (holometabolous development) will exhibit evidence of a merger of insect and onychophoran genomes, and thus have larger DNA amounts. It so happens that a) this is bass-ackwards, and b) it is easy to find this out by checking my Animal Genome Size Database (which is what Hart and Grosberg did) or my paper in Genetica from 2002 or my book from 2005 or pretty much any decent paper on insect genome sizes in the last several years. I often have to summarize reasons why people should care about genome size, as when preparing grant applications. I never thought that I could add to this list, “refuting nutty hypotheses about the origins of caterpillars”. I won’t, though, even if many of the data used in the comparison were generated by me or my students (including pretty much all the Lepidoptera estimates). Gregory, TR. 2002. Genome size and developmental complexity. Genetica 115: 131-146. Gregory, TR. 2005. Genome size evolution in animals. In: The Evolution of the Genome, ed. TR Gregory. Elsevier, San Diego, p. 3-87. Hart, MW and Grosberg RK. 2009. Caterpillars did not evolve from onychophorans by hybridogenesis. Proc. Natl. Acad. Sci. USA, in press. Williamson, D.I. 2009. Caterpillars evolved from onychophorans by hybridogenesis. Proc. Natl. Acad. Sci. USA 106:15786–15790. Coyne (sort of) discovers non-adaptive explanations.